We consider what a world would look like in “A World Without Prejudice”; pupils explore themes like disability, ageism, sexism and bullying. This unit focuses on developing an cartoon / animated sequence of Keith Haring styled figures that are shown overcoming a prejudice. 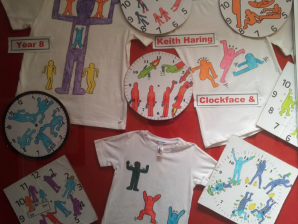 The resulting designs are refined and may be used to decorate clock faces, T-shirts or papier machie wellie boots (that pupils make from scratch).